ZX6R Forum > ZX6R Forum > Racing > Lap timer. Which one? Any lap timer recommendations? I usually just throw my phone in the back of the bike with RaceChrono to know my record times. Looking into the Aim Solo 2 (user guide). 399$ is a bit steep though. . Worth it? If you go the AiM route, get the DL version. A bit more, but it's an actual data logger. 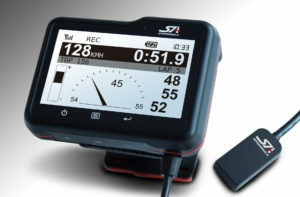 Or get an XT Racing GPX Pro, like the one I have. Try to find a good deal on a used online, and save yourself a bunch of money. These aren't things that wear out, so a used one is just as good as a new one (long as it works of course lol). I got my GPX Pro 8 for $450 shipped. Retail is like $780. Works awesome, I love it. They don't have a harness available for zx6r's. I wonder if they have a generic kit that taps into the harness. Which one?? The AiM solo DL or the XT Racing one? I used my XT Racing on the ZX6R just fine, and on the R3. The wiring is universal, goes to any bike. I had 2 of them, one for the ZX6R and one for the R3 (and before the CBR500). I had the unit velcro'd to my tank, that way I could just unplug it and move it from one bike to the other whenever I wanted in just a few seconds. On the ZX6R I had it setup to read RPM, TPS and brake pressure after I bought a pressure sensor for it. Nice. I found the universal wiring harness. They have premade ECU connections for pretty much every sportbike except the zx6r. lol. Doesn't look like an XT one, but similar concept. It's really just a bunch of wires that lead to a quick-connector. I have the GPX PRo4 and I love it. I have it wired to record rpm, throttle position and brake switch. Love the programable tach and shift lights also. Much easier to see during a race than the stock tachometer. 2005 ZX6-R stock motor, Leo Vince full system, Power Commander, GP tech fork internals, stock brakes, Penske shock, CFM rearsets, Motion Pro Quick throttle, Pit bull steering stabilizer, XT Racing GPX laptimer and DAQ. Last edited by jd41; 07-20-2018 at 11:19 PM. Weird that it doesn't have the "learn track" feature. That's what I did for about 5 years - old iPhone with Harry's Lap Timer. Works great and is almost free. I completely agree with you, but I really do think the features that the data loggers provide can help improve with track riding. I want to see how long I really keep the throttle open, how hard I brake/waste time braking and accurate race lines with lean angle. What Ken Hill said on podcast #36 made sense. Motorcycle riding is not an art, it is quantifiable, and you can correct it and improve. If riding is an art, it means you don't know what you're doing.